From blood sport of taking down the opponent with style, to winning your audience with fashion. Entrepreneur's editor-in-chief gets a first-hand look at the passion of MMA culture. 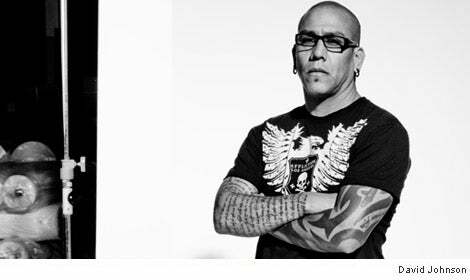 Hear from Tom Atencio on the evolution of Affliction. Tom Atencio sports tribal tattoos, skeletal silver jewelry and muscles sculpted from years of practicing mixed martial arts, the violent spectator sport that combines elements of wrestling, kickboxing and street fighting. Perhaps you've heard of MMA. Senator John McCain once likened it to "human cockfighting." (Debatable, but it's certainly bloody.) Maybe you've seen the footage--of Randy Couture taking an opponent to the ground like a lion after prey, or Tito Ortiz kicking a foe's face within the confines of an eight-sided cage. But you probably don't know MMA as well as Atencio does. Not only has he fought professionally, he's also making his MMA lifestyle a bona fide business. Atencio is the vice president and frontman for Seal Beach, California-based Affliction clothing, a 4-year-old rock 'n' roll-lifestyle apparel brand comparable to runaway successes like Ed Hardy and Von Dutch. Affliction's look includes hoodies, skull caps, T-shirts with gothic fonts, and loose-fitting jeans, which, as luck would have it, is the preferred uniform of the 18- to 34-year-old males who follow the MMA circuit. Affliction never planned to take a jab at the fight-club crowd until last year, when it partnered up with none other than Donald Trump. At the time, the company was endorsing athletes across several disciplines (surfing, football, basketball--it even sponsors Ozzy Osbourne). But there was another market begging to be tapped. Money in hand, Atencio, 42, and his partners, Eric Foss and Clifton Chason, both 35, forged a relationship with professional boxing's Golden Boy Promotions (owned by pay-per-view king Oscar De La Hoya) and hosted Affliction's second MMA bout, which took place in Anaheim, California, earlier this year. The event filled more than 13,000 seats and drew in more than 100,000 paying viewers. The widely viewed ticket wasn't a fluke. All signs say that Affliction has even more to look forward to. MMA's cable and pay-per-view audiences often beat TV ratings produced by pro sporting events--including baseball, NASCAR and the Stanley Cup Finals-in the coveted 18-to-34 age bracket. The Sporting Goods Manufacturers Association reports that participation in martial arts, including MMA, has grown about 11 percent since 2000. And Action Sports Retailer, the popular action-sports apparel convention, added a separate MMA clothing show last September. "There's been tremendous growth in the MMA apparel market," says Eric Foster, president and COO of MMAjunkie.com, one of the sport's most visited independent sites. "The companies that are successful are run by real MMA fans who understand the sport." To Foster's point, Affliction, whose other staffers also sport huge muscles and acres of scar tissue, has seen average annual growth of more than 300 percent in the past two years. (Foss says the company broke the $100 million revenue mark in 2008.) What's more, says Atencio, "MMA is still in its infancy. In five to 10 years, it will explode." Of course, Affliction isn't the only company zeroing in on the MMA scene. Late last year, former sports agent Bjorn Rebney paired up with Hollywood producer Brad Epstein to launch Bellator Fighting Championships, a single-elimination fight series that airs on ESPN Deportes. The duo will sell apparel--T-shirts, hoodies and skull caps--both to promote the event and tap into a potential profit stream. And while skull-crushing athletes such as Ortiz have made industries out of MMA clothing lines (his is called Punishment Athletics), accountant and longtime MMA aficionado Joe Abbott recently sank $50,000 into the launch of his own Knockout Brand clothing line. At the moment, however, none of those enterprises poses a major threat to Affliction. Who's the real competition? First, ironically, there's the Ultimate Fighting Championship, or UFC, which is to MMA what the NFL is to football. UFC has its own line of apparel that sells by the truckload. Then there's TapouT, an apparel line run by Dan "Punkass" Caldwell and Marc Kreiner. (As this issue went to press, we learned that TapouT co-founder Charles "Mask" Lewis died in a car accident in Newport Beach, California. Our kindest wishes go to his family, friends and business partners.) TapouT was launched as a T-shirt peddling business out of the trunk of a car in 1997. Four years later, when brothers Lorenzo and Frank Fertitta bought the UFC for $2 million, TapouT became a key sponsor of UFC bouts. TapouT also sells its clothing at major fights and has an eponymous reality show going into its third season. That show also shares producers with the UFC's groundbreaking Ultimate Fighter on Spike TV. Caldwell sees the program as an entrepreneur's dream: "Our TV show is like a one-hour infomercial for us." To make competition more brutal for Affliction, TapouT recently inked a global licensing deal with Skechers shoes that could help it top last year's sales of more than $50 million. Maybe he's just wearing his game face, but Atencio seems as fired up to compete as a fighter entering an MMA cage. He's quick to point out his company's anabolic growth, including the recent unveiling of its 150,000-square-foot headquarters, which includes an MMA ring where visiting fighters can train. Affliction also plans to promote future events that could create the kind of high-profile business showdown that MMA fans love. "The UFC is threatened by us," he says. "I'm up for the challenge."